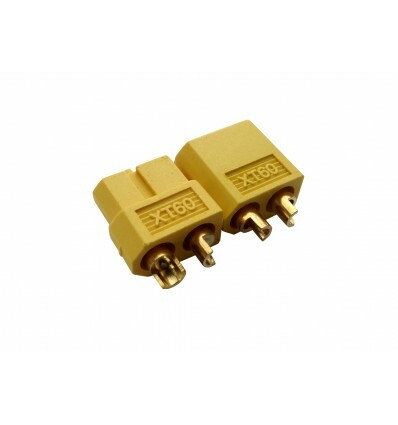 This pair of male/female XT60 Connectors use gold-plated spring-pins to form solid connections for high current applications – Ideal for RC vehicles. These XT60 Connectors come in Male & Female Pairs, and are designed with gold-plated spring pins that form solid, secure connections for high current applications. They are made to directly compete against Deans T-Connectors, which are overpriced due to the patent attached to them, and offer even better quality connections at a fraction of the price. These connectors are capable of handling current up to 60A continuous, and are recommended for voltages of around 42V or higher. The connections they form are solid and produce very low temperatures despite the current that they transfer, and they utilise high friction to hold the connectors firmly in place. They can also only be connected in one way, ensuring that you never have to stress about plugging cables in the wrong way, which would typically damage Electronics Components or connected batteries. If you are looking for Connectors that can handle high currents and voltages with little chance of unexpected disconnects or insecure connections, these XT60 Male/Female Pairs are an excellent choice that are focused on both quality and affordability. Although these XT60 Male/Female Connector Pairs are primarily made for RC vehicles and applications involving high-power LiPo Batteries, they can of course be used for almost any electrical application up to 60A current rating. The wires typically used with these connectors are around 12AWG, which is more than enough to transfer high currents and voltages, and the quality of the connections formed by the gold-plated spring pins are unbeatable within this price range. Finally, if you are looking for a single connector of this type, we also stock the Male XT60 Connector with wiring preinstalled, which saves you the time and effort of having to solder wires to the connector and potentially risk damaging your higher-value components.